To encourage people to bring their own mugs and reduce waste, Café Brindabella in Canberra charges customers a 20 cent ‘Greening Levy’ for takeaway cups. 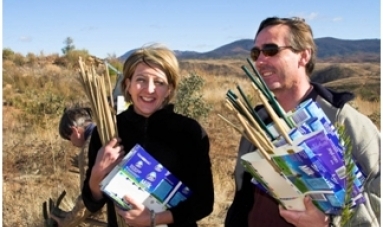 The funds raised enable Greening Australia to assist local landowners to undertake critical revegetation on their farms. The Bridging the Gaps project provides vital funding to assist landowners when they are not eligible through other funding schemes. It also contributes to the maintenance of previous projects, and serves to keep these landowners engaged with Greening Australia and strengthen our landowner connections. Café Brindabella owner Skye Palmer says that since launching the scheme the business has generated almost $300,000 to go towards the project. “We’re only a small business, but it shows every small business can make a difference. I decided to support Greening Australia in the initiative because they are local, and they’re doing something good so we can show people where their money is going – we’ve even had a few DFAT workers go and plant some trees themselves, and we try and post photos in the café of the restoration that can happen from planting trees, particularly after our bushfires, so customers can see where their money is going.”Over the last 12 months 23 new landholders have been assisted through the funding provided by Café Brindabella. With the assistance from the project, these landholders have been able to enhance 78 hectares of remnant woodland; undertake 32 hectares of revegetation and stabilise 300 metres of gully through fencing, tubestock planting and direct seeding.